For the insect anatomical structure, see Antenna (biology). For the flagella of male Solifugae, see Solifugae. A flagellum (/fləˈdʒɛləm/; plural: flagella) is a lash-like appendage that protrudes from the cell body of certain prokaryotic and eukaryotic cells. The word flagellum in Latin means whip. The primary role of the flagellum is locomotion, but it also often has function as a sensory organelle, being sensitive to chemicals and temperatures outside the cell. Flagella are organelles defined by function rather than structure. Large differences occur between different types of flagella; the prokaryotic and eukaryotic flagella differ greatly in protein composition, structure, and mechanism of propulsion. However, both can be used for swimming. An example of a flagellate bacterium is the ulcer-causing Helicobacter pylori, which uses multiple flagella to propel itself through the mucus lining to reach the stomach epithelium. An example of a eukaryotic flagellate cell is the mammalian sperm cell, which uses its flagellum to propel itself through the female reproductive tract. Eukaryotic flagella are structurally identical to eukaryotic cilia, although distinctions are sometimes made according to function and/or length. Fimbriae and pili are also thin appendages, but have different functions and are usually smaller. Prokaryotic flagella run in a rotary movement, while eukaryotic flagella run in a bending movement. The prokaryotic flagella use a rotary motor, and the eukaryotic flagella use a complex sliding filament system. Eukaryotic flagella are ATP driven, while prokaryote ones are proton driven. The basal body has several traits in common with some types of secretory pores, such as the hollow, rod-like "plug" in their centers extending out through the plasma membrane. Given the structural similarities between bacterial flagella and bacterial secretory systems, bacterial flagella may have evolved from the type-three secretion system; however, whether these pores are derived from the bacterial flagella or the bacterial secretory system is not known for certain. 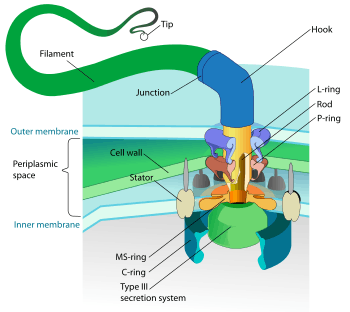 The bacterial flagellum is driven by a rotary engine (Mot complex) made up of protein, located at the flagellum's anchor point on the inner cell membrane. The engine is powered by proton motive force, i.e., by the flow of protons (hydrogen ions) across the bacterial cell membrane due to a concentration gradient set up by the cell's metabolism (Vibrio species have two kinds of flagella, lateral and polar, and some are driven by a sodium ion pump rather than a proton pump). The rotor transports protons across the membrane, and is turned in the process. The rotor alone can operate at 6,000 to 17,000 rpm, but with the flagellar filament attached usually only reaches 200 to 1000 rpm. The direction of rotation can be switched almost instantaneously, caused by a slight change in the position of a protein, FliG, in the rotor. The flagellum is highly energy efficient and uses very little energy. Through use of their flagella, E. coli is able to move rapidly towards attractants and away from repellents, by means of a biased random walk, with 'runs' and 'tumbles' brought about by rotating its flagellum counterclockwise and clockwise, respectively. At least 10 protein components of the bacterial flagellum share homologous proteins with the type-three secretion system (TTSS), hence one likely evolved from the other. Because the TTSS has a similar number of components as a flagellar apparatus (about 25 proteins), which one evolved first is difficult to determine. However, the flagellar system appears to involve more proteins overall, including various regulators and chaperones, hence it has been argued that flagella evolved from a TTSS. However, it has also been suggested that the flagellum may have evolved first or the two structures evolved in parallel. Early single-cell organisms' need for motility (mobility) support that the more mobile flagella would be selected by evolution first, but the TTSS evolving from the flagellum can be seen as 'reductive evolution', and receives no topological support from the phylogenetic trees. The hypothesis that the two structures evolved separately from a common ancestor accounts for the protein similarities between the two structures, as well as their functional diversity. Some authors have argued that flagella cannot have evolved because they can only function properly when all proteins are in place. In other words, the flagellar apparatus is "irreducibly complex". This has long been debunked, because many proteins can be deleted or mutated and the flagellum still works, though sometimes at reduced efficiency. In fact, the composition of flagella is surprisingly diverse across bacteria, with many proteins only found in some species, but not others. Hence, the flagellar apparatus is clearly very flexible in evolutionary terms and perfectly able to lose or gain protein components. Lophotrichous bacteria have multiple flagella located at the same spot on the bacterial surfaces which act in concert to drive the bacteria in a single direction. 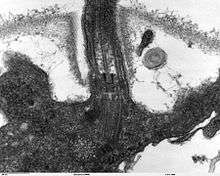 In many cases, the bases of multiple flagella are surrounded by a specialized region of the cell membrane, the so-called polar organelle. Other bacteria, such as most spirochetes, have two or more specialized flagella (endoflagella) arising from opposite poles of the cell, which together constitute the so-called "axial filament" that is located within the periplasmic space between the flexible cell wall and an outer sheath. The rotation of the axial filament relative to the cell body causes the entire bacterium to move forward in a corkscrew-like motion, even through material viscous enough to prevent the passage of normally flagellated bacteria. The archaellum possessed by some members of domain Archea is superficially similar to the bacterial flagellum; in the 1980s, they were thought to be homologous on the basis of gross morphology and behavior. Both flagella and archaella consist of filaments extending outside the cell, and rotate to propel the cell. Archaeal flagella have a unique structure which lacks a central channel. Similar to bacterial type IV pilins, the archaeal flagellins (archaellins) are made with class 3 signal peptides and they are processed by a type IV prepilin peptidase-like enzyme. The archaellins are typically modified by the addition of N-linked glycans which are necessary for proper assembly and/or function. These differences could mean that the bacterial flagella and archaella could be a classic case of biological analogy, or convergent evolution, rather than homology. However, in comparison to the decades of well-publicized study of bacterial flagella (e.g. by Howard Berg), archaella have only recently begun to garner scientific attention. Besides the axoneme and basal body, relatively constant in morphology, other internal structures of the flagellar apparatus are the transition zone (where the axoneme and basal body meet) and the root system (microtubular or fibrilar structures which extends from the basal bodies into the cytoplasm), more variable and useful as indicators of phylogenetic relationships of eukaryotes. Other structures, more uncommon, are the paraflagellar (or paraxial, paraxonemal) rod, the R fiber, and the S fiber. For surface structures, see below. ↑ Wang, Qingfeng; Suzuki, Asaka; Mariconda, Susana; Porwollik, Steffen; Harshey, Rasika M (2005). "Sensing wetness: A new role for the bacterial flagellum". The EMBO Journal. 24 (11): 2034–42. doi:10.1038/sj.emboj.7600668. PMC 1142604 . PMID 15889148. ↑ Bardy SL, Ng SY, Jarrell KF (February 2003). "Prokaryotic motility structures". Microbiology (Reading, Engl.). 149 (Pt 2): 295–304. doi:10.1099/mic.0.25948-0. PMID 12624192. ↑ Lefebvre PA; Lefebvre, PA (2001). "Assembly and Motility of Eukaryotic Cilia and Flagella. Lessons from Chlamydomonas reinhardtii". Plant Physiol. 127 (4): 1500–1507. doi:10.1104/pp.010807. PMC 1540183 . PMID 11743094. 1 2 Jarrell, K (editor) (2009). Pili and Flagella: Current Research and Future Trends. Caister Academic Press. ISBN 978-1-904455-48-6. ↑ Lacy BE, Rosemore J (October 2001). "Helicobacter pylori: ulcers and more: the beginning of an era" (abstract page). J. Nutr. 131 (10): 2789S–2793S. PMID 11584108. ↑ Malo AF, Gomendio M, Garde J, Lang-Lenton B, Soler AJ, Roldan ER (June 2006). "Sperm design and sperm function". Biol. Lett. 2 (2): 246–9. doi:10.1098/rsbl.2006.0449. PMC 1618917 . PMID 17148374. ↑ Silverman M, Simon M (1974). "Flagellar rotation and the mechanism of bacterial motility". Nature. 249 (452): 73–74. doi:10.1038/249073a0. PMID 4598030. ↑ Meister GL, Berg HC (1987). "Rapid rotation of flagellar bundles in swimming bacteria". Nature. 325 (6105): 637–640. doi:10.1038/325637a0. ↑ Berg HC, Anderson RA (1973). "Bacteria Swim by Rotating their Flagellar Filaments". Nature. 245 (5425): 380–382. doi:10.1038/245380a0. PMID 4593496. ↑ Jahn TL, Bovee EC (1965). "Movement and Locomotion of Microorganisms". Annual Review of Microbiology. 19: 21–58. doi:10.1146/annurev.mi.19.100165.000321. PMID 5318439. ↑ Harshey RM (2003). "Bacterial Motility on a Surface: Many Ways to a Common Goal". Annual Review of Microbiology. 57: 249–273. doi:10.1146/annurev.micro.57.030502.091014. PMID 14527279. ↑ Jarrell (2009). "Archaeal Flagella and Pili". Pili and Flagella: Current Research and Future Trends. Caister Academic Press. ISBN 978-1-904455-48-6. ↑ Macnab RM (2003). "How bacteria assemble flagella". Annu. Rev. Microbiol. 57: 77–100. doi:10.1146/annurev.micro.57.030502.090832. PMID 12730325. ↑ Diószeghy Z, Závodszky P, Namba K, Vonderviszt F (2004). "Stabilization of flagellar filaments by HAP2 capping". FEBS Lett. 568 (1–3): 105–9. doi:10.1016/j.febslet.2004.05.029. PMID 15196929. ↑ Galkin VE, Yu X, Bielnicki J, Heuser J, Ewing CP, Guerry P, Egelman EH (2008). "Divergence of quaternary structures among bacterial flagellar filaments". Science. 320 (5874): 382–5. doi:10.1126/science.1155307. PMID 18420936. ↑ Atsumi T, McCarter L, Imae Y (1992). "Polar and lateral flagellar motors of marine Vibrio are driven by different ion-motive forces". Nature. 355 (6356): 182–4. doi:10.1038/355182a0. PMID 1309599. ↑ Dean, Tim. "Inside nature’s most efficient motor: the flagellar", Australian Life Scientist, 2 August 2010. Retrieved on 2013-08-28. ↑ Unlocking the secrets of nature's nanomotor Nikkei Asian Review, 2014. ↑ Dusenbery DB (2009). "Chapter 13". Living at Micro Scale: The Unexpected Physics of Being Small. Cambridge: Harvard University Press. ISBN 0-674-03116-4. ↑ Hildebrand, Milton (November 1959). "Motions of the running Cheetah and Horse". Journal of Mammalogy. 44 (4): 481–495. JSTOR 1376265. Although according to Cheetah, Luke Hunter and Dave Hamman, (Struik Publishers, 2003), pp. 37–38, the cheetah's fastest recorded speed was 110 km/h (68 mph). ↑ Minamino T, Imada K, Namba K (2008). "Mechanisms of type III protein export for bacterial flagellar assembly". Mol. Biosyst. 4 (11): 1105–15. doi:10.1039/b808065h. PMID 18931786. ↑ Asakura S, Eguchi G, Iino T (1964). "Reconstitution of Bacterial Flagella in Vitro". J. Mol. Biol. 10: 42–56. doi:10.1016/S0022-2836(64)80026-7. PMID 14222895. 1 2 Saier, M (2004). "Evolution of bacterial type III protein secretion systems". Trends in Microbiology. 12 (3): 113–115. doi:10.1016/j.tim.2004.01.003. PMID 15001186. ↑ Gophna U, Ron EZ, Graur D (July 2003). "Bacterial type III secretion systems are ancient and evolved by multiple horizontal-transfer events". Gene. 312: 151–63. doi:10.1016/S0378-1119(03)00612-7. PMID 12909351. ↑ Guttman D, McCann H (2008). "Evolution of the type III secretion system and its effectors in plant-microbe interactions". New Phytologist. 177 (1): 33–47. doi:10.1111/J.1469-8137.2007.02293.X. ↑ Kim M, Bird JC, Van Parys AJ, Breuer KS, Powers TR (December 2003). "A macroscopic scale model of bacterial flagellar bundling". Proc. Natl. Acad. Sci. U.S.A. 100 (26): 15481–5. doi:10.1073/pnas.2633596100. PMC 307593 . PMID 14671319. ↑ Macnab RM (January 1977). "Bacterial flagella rotating in bundles: a study in helical geometry". Proc. Natl. Acad. Sci. U.S.A. 74 (1): 221–5. doi:10.1073/pnas.74.1.221. PMC 393230 . PMID 264676. ↑ Kim YK, McCarter LL (2000). "Analysis of the Polar Flagellar Gene System of Vibrio parahaemolyticus". Journal of Bacteriology. 182 (13): 3693–3704. doi:10.1128/JB.182.13.3693-3704.2000. PMC 94540 . PMID 10850984. ↑ Atsumi T, Maekawa Y, Yamada T, Kawagishi I, Imae Y, Homma M (1 August 1996). "Effect of viscosity on swimming by the lateral and polar flagella of Vibrio alginolyticus". Journal of Bacteriology. 178 (16): 5024–5026. PMC 178290 . PMID 8759871. ↑ McCarter LL (2004). "Dual Flagellar Systems Enable Motility under Different Circumstances". Journal of Molecular Microbiology and Biotechnology. 7 (1–2): 18–29. doi:10.1159/000077866. PMID 15170400. ↑ Merino S, Shaw JG, Tomás JM (2006). "Bacterial lateral flagella: an inducible flagella system". FEMS Microbiol Lett. 263 (2): 127–35. doi:10.1111/j.1574-6968.2006.00403.x. PMID 16978346. ↑ Belas R, Simon M, Silverman M (1986). "Regulation of lateral flagella gene transcription in Vibrio parahaemolyticus". J Bacteriol. 167 (1): 210–8. PMC 212863 . PMID 3013835. ↑ Canals R, Altarriba M, Vilches S, Horsburgh G, Shaw JG, Tomás JM, Merino S (2006). "Analysis of the Lateral Flagellar Gene System of Aeromonas hydrophila AH-3". Journal of Bacteriology. 188 (3): 852–862. doi:10.1128/JB.188.3.852-862.2006. PMC 1347325 . PMID 16428388. ↑ Canals R, Ramirez S, Vilches S, Horsburgh G, Shaw JG, Tomás JM, Merino S (January 2006). "Polar Flagellum Biogenesis in Aeromonas hydrophila". J. Bacteriol. 188 (2): 542–55. doi:10.1128/JB.188.2.542-555.2006. PMC 1347287 . PMID 16385045. ↑ Cavalier-Smith T (1987). "The origin of eukaryotic and archaebacterial cells". Ann. N. Y. Acad. Sci. 503 (1): 17–54. doi:10.1111/j.1749-6632.1987.tb40596.x. PMID 3113314. 1 2 Ghosh A, Albers SV (January 2011). "Assembly and function of the archaeal flagellum". Biochem. Soc. Trans. 39 (1): 64–9. doi:10.1042/BST0390064. PMID 21265748. ↑ Berg, Howard C. (2003). E. coli in motion (1. Aufl. ed.). New York: Springer. ISBN 9780387008882. ↑ Taylor, F. J. [The collapse of the two-kingdom system, the rise of protistology and the founding of the International Society for Evolutionary Protistology (ISEP)]. International journal of systematic and evolutionary microbiology 53: 1707-1714. ↑ Hülsmann, N. (1992). Undulipodium: end of a useless discussion. Eur J Protistol 28, 253–257. ↑ Adl, Sina M., et al. The revised classification of eukaryotes. Journal of Eukaryotic Microbiology 59.5 (2012): 429-514. ↑ Andersen, R. A., Barr, D. J. S., Lynn, D. H., Melkonian, M., Moestrup, Ø., & Sleigh, M. A. (1991). Terminology and nomenclature of the cytoskeletal elements associated with the flagellar/ciliary apparatus in protists. Protoplasma, 164 (1-3), 1-8. ↑ Leadbeater, B.S.C., Green, J.C. (eds.). The Flagellates. Unity, diversity, and evolution. London: Taylor and Francis. ↑ Barsanti, L. & Gualtieri, P. (2006). pp. 63-84. ↑ Pazour GJ (October 2004). "Intraflagellar transport and cilia-dependent renal disease: the ciliary hypothesis of polycystic kidney disease". J. Am. Soc. Nephrol. 15 (10): 2528–36. doi:10.1097/01.ASN.0000141055.57643.E0. PMID 15466257. ↑ Raven, J.A. 2000. The flagellate condition. In: (B.S.C. Leadbeater and J.C. Green, eds) The flagellates. Unity, diversity, and evolution. The Systematics Association Special Volume 59. Taylor and Francis, London. pp. 269–287. 1 2 Adl et al. (2012). ↑ Webster & Weber (2007). ↑ South, G.R. & Whittick, A. (1987). Introduction to Phycology. Blackwell Scientific Publications, Oxford. p. 65, . ↑ Lee, R. E. (2008). Phycology (4th ed.). Cambridge University Press. p. 7, . ↑ Corliss, J.O., Lom, J. (2002). An annotated glossary of protozoological terms. In: Lee J.J., Leedale G.F., Bradbury P. (eds.). An illustrated guide to the protozoa, second edition, pp. 1346–1385. Society of Protozoologists, Lawrence. 1 2 Jeuck, A., & Arndt, H. (2013). A short guide to common heterotrophic flagellates of freshwater habitats based on the morphology of living organisms. Protist, 164 (6): 842-860, . ↑ Sleigh, M. (1989). Protozoa and other Protists. Edward Arnold, London. pp 98-99, . ↑ Austin, C. R. (1995). ↑ Sparrow, F.K. (1960). Aquatic phycomycetes. 2nd ed. Ann Arbor, Michigan: University of Michigan Press, p. 15, . ↑ Hibberd, D.J. (1976). The ultrastructure and taxonomy of the Chrysophyceae and Prymnesiophyceae (Haptophyceae): a survey with some new observations on the ultrastructure of the Chrysophyceae. Journal of the Linnean Society of London, Botany 72: 55-80. ↑ Sleigh, M.A. (1985). Origin and evolution of flagellar movement. Cell Motil. 5:137-138, . "Molecular Machines Museum Index". Access Research Network. 2001. Retrieved 2008-05-18. Berg, Howard C. (January 2000). "Motile Behavior of Bacteria". Physics Today. 53 (1): 24. doi:10.1063/1.882934. Charles Lindemann (2008-04-04). "Mechanisms of sperm motility". Oakland University. Retrieved 2008-05-18. Purcell, E.M. (1977). "Life at Low Reynolds Number" (PDF). American Journal of Physics. 45 (1): 3–11. doi:10.1119/1.10903. N. J. Matzke (2003-11-10). "Evolution in (Brownian) space: a model for the origin of the bacterial flagellum". www.talkdesign.org.